With some shows it’s love at first sight – or sound. Others slyly creep up on you after the fact, infecting you like a virus. Still others out and out break your heart for one misguided reason or another. But most frustrating of all are the shows you want to love that wind up leaving you cold. So went my heart at Once, the slender new musical which seems to have lost its way in an over-produced transfer of the well-received production at New York Theatre Workshop. For anyone who hasn’t seen the moody and romantic film on which it’s based, it’s the story of a socially disconnected Irish busker and an immigrant girl who meet and over the course of three Dublin days enjoy a mutual love affair with music and – unconsummated – each other. Simple, spare and elegant, it’s a film about the power of music and the redemptive effect of having someone believe in you when you no longer believe in yourself. When the film’s two leads, Glen Hansard and Marketa Irglova – who had gone on to become partners in life as well – won an Oscar for Best Song (the hypnotic Falling Slowly) it seemed to bring the story full circle. What gets lost in the stage version is the Spartan elegance that lets you feel for the characters without being told what you should feel. Director John Tiffany relocates the action to a Dublin pub and suddenly we’re all pullin’ for pints, so we are. Feel free to go up on stage before the show and grab a drink. If that’s not twee enough for you, there’s a ceilidh band onstage to Oirish up the joint even more. (Don’t worry if you show up late, the whole noxious process will repeat itself at intermission.) 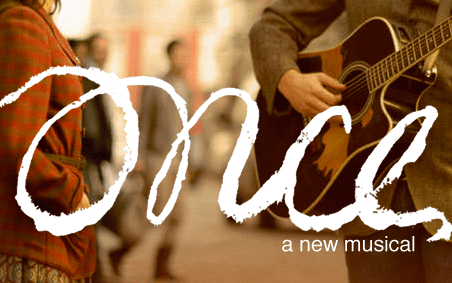 Despite this annoying tendency to tart things up for Broadway – not to mention the now cloying trend of actors doubling as the band – there are a pair of wonderful performances by Steve Kazee and Cristin Miloti as – don’t choke – Boy and Girl. They share great chemistry – and even better voices. If Once were built around their artistic collaboration this could be the stuff of fairy tales, as the title subtly implies. But Enda Walsh’s lumbering book skews the focus towards something far less interesting, another boy meets girl, boy loses girl story. A handful of barely sketched secondary characters make lame attempts at comic relief but it comes at the expense of dragging the story down to a leaden pace. I’m wondering if the show ran with an intermission off-Broadway, too, or if what’s happening uptown is a just a bloated excuse to sell merchandise and drinks. Either way, a judicious bit of dramaturgy would have served this production well. If anything, Once highlights a problem specific to many a fairytale: let them go on too long and they eventually turn into nightmares.